Think trampolining is just for the kids? Think again! Bouncing on a trampoline is not only fun (and brings back those carefree memories of childhood again) but it is also surprisingly beneficial for your health, especially when it comes to weight loss. Regular aerobic exercise is essential for maintaining overall health and wellbeing. Did you know that a study carried out by NASA found that bouncing on a trampoline for just 10 minutes is a better cardiovascular workout than 30 minutes of running? Trampolining is low-impact, meaning it’s far easier on the joints – especially the ankles and knees. So, if you have any existing or pre-existing injury, trampolining could be a great option to keep healthy and lose weight all while having fun! If you’re someone who prefers to work out at home or who can’t stand the thought of spending an hour at a crammed gym after work, then trampolining is for you. The benefits of trampolining are plentiful; you are getting a high-intensity workout and burning calories while boosting your metabolism and feel-good hormones. Trampolining also allows for a variety of exercises, so you can incorporate calisthenic workouts in your routine. Trampolining is a wonderful source of stress relief and can help to combat depression and anxiety by increasing endorphins in the brain. Better mental and physical health leads to improved concentration, sleep and energy; making trampolining an overall mind, body and soul workout. Trampolining improves overall muscle tone by reducing fat and strengthening the body. Jumping on a trampoline is particularly good for core strength and building abdominal muscles, since the muscles used to stabilise the core are constantly engaged to keep you balanced. This means you are developing tighter, stronger stomach muscles as well as a stronger back which is the foundation of good posture and coordination. Trampolining is a full-body workout, engaging the thighs, legs and glutes that are all being tightened and toned as you jump. The arms are also getting a workout with the constant swinging action it takes to propel yourself upward. For women, trampolining actually helps to improve the pelvic floor muscles since every time you land on the trampoline, your pelvic floor has to contract to keep everything in place. Unlike other jumping exercises, trampolining can be tweaked to further enhance muscle tone by incorporating light hand weights as you jump or by using a beach ball to target the upper body while your lower body does most of the work. The best part about trampolining for weight loss and overall fitness is that you don’t have to be an athlete or regular gym-goer to get started. 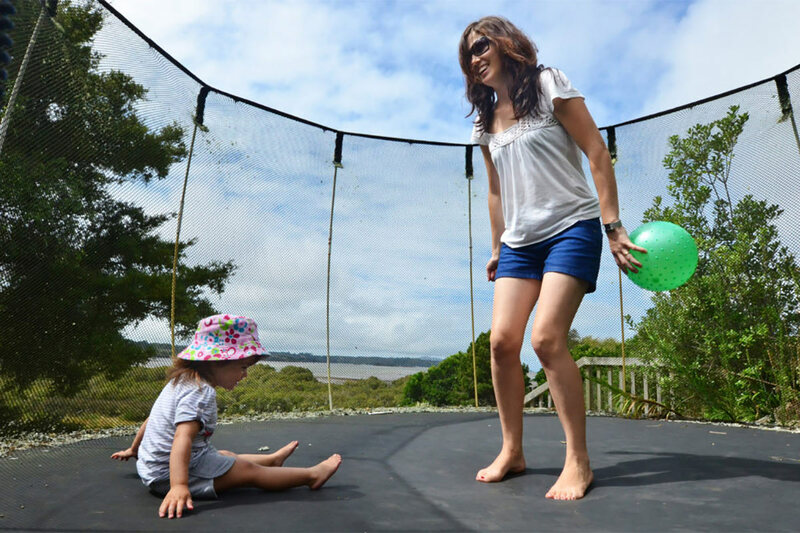 Starting a trampolining exercise routine is simple whether you have a small trampoline such as a mini rebounder or a large family-sized trampoline in the backyard. Start small and gradually increase your intensity when you begin feeling more comfortable and confident with bouncing and balance. Walk in place: Begin by standing tall and knees relaxed. Start walking on the spot by bringing one foot up followed by the other as if you’re marching. Slowly swing your arms at the same time, building up your pace as you get comfortable with the movement. Light bouncing: Practice jumping on the spot, starting small and building yourself up to a safe and comfortable jump. If you have an above ground or in-ground trampoline you can practice a seat drop by jumping in the air and bringing your legs out in front as you land on your bottom keeping legs extended. Squats & lunges: You can combine cardio with your strength training by doing a cardio & strength circuit on a trampoline. Incorporate a combination of squats and lunges while on the trampoline (this will also improve balance & coordination!) or by using the trampoline as a step. Using a trampoline is a great way to exercise and an efficient way to stay in shape. Not only is it a convenient way to burn those calories, but the versatility provided by your trampoline at home means can incorporate a diverse range of exercises in your workout in order to achieve a holistic, full body workout.